So recently another friend and I arranged a “content exchange” — we both give each other something to read and after reading it I provide some commentary about what I read. In this case my friend gave me three distinct pieces of content to review, so I will write a brief review about each one. As many people know the beginning of the Old Testament is the book Genesis which outlines the primary creation myth of Christianity, Judaism and Islam. It is allegedly written by Moses as a prophet of God. Naturally I have read these chapters several times before. But in any case, I read through them again with fresh eyes to analyse them from a secular standpoint. These three chapters outline a story — the Bible’s version of why humans exist and how we got here on the earth. My primary, extremely basic response is: Why should I believe this story, instead of any other creation myth? I want to put things into perspective for a minute. Note, if you scroll down the page, eventually you arrive at a category of creation myths called “ex nihilo” (out of nothing), and underneath that you will see the Genesis creation myth. 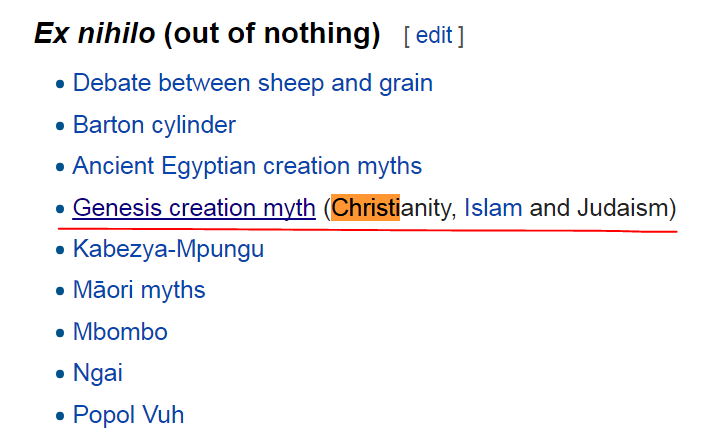 Along with an entire massive list of creation myths we’ve probably not heard of. The main reason we’ve not heard of them is purely chance — we were born into, or converted into religions that subscribe to certain creation myths. But to many people around the world, these other creation myths are just as real — and explain the purpose of life just as profoundly. And on and on it goes, in great detail. Why not believe that creation myth? Why believe in Adam and Eve? Where’s the evidence? Now, we turn to something a bit more interesting. If you go to a modern university and learn theology, chances are you will encounter information about the Bible’s authorship — who were the original authors of the various sections of the Bible? Regarding the Torah, among the three major possible models (which all agree that the Torah did not have a single author), there is the JEPD model (The Documentary Hypothesis). As I was reading Genesis 1, 2 and 3, I was struck with how obvious the transition is between The Priestly Source (who wrote Genesis 1:1 – 2:3), and then the sharp cut to the Jahwist source (wrote the rest of chapter 2 and 3). It’s quite obvious that there’s a sharp change in tone and language, furthermore the entire creation story is re-told (rather obviously), with several points contradicting! Nothing much more to say here. It’s been fun. Hey Shawn, I just watched your discussion with two Mormons apologists on YouTube and from that found the link to your blog. I’m a former Mormon as well. I really liked what you had to say and decided to come visit! I found this post way interesting, particularly with the illustration of the disconnect in the first few verses of Gen. 2. I never knew that current scholarship understands the Pentateuch like this, with one author for Genesis 1:1 – 2:3 and another for Gen. 2:4 – 3. A while back, I did my own personal analysis of Joseph’s revision of the creation story in his Book of Moses (originally a large excerpt from the JST) chapters 2 and 3. To clarify, I was already a non-believer at this point. But my primary goal was to see if it allowed for the theory of evolution in any way since it had always been claimed by the church to shed new light on the creation, or give us “plain and precious truths” if you will, that had once been lost to history. I did find that it was irreconcilable with evolution, partly because Moses 3 was simply too confusing and nonsensical to read with evolution in mind. I had to stop pigeon-holing it into evolution and just read the text as it stood and try to understand what it was communicating. After reading Moses 3 and Genesis 2, not only did I notice this disconnect in the first few verses of Gen. 2. but also I got the impression that Joseph Smith knew about this too. Here is an old Reddit post that explains my analysis and conclusions about what I found. Thank you for being a positive and respectful voice for ExMormons! Hi Thomas, thanks for stopping by and commenting! However, obviously I agree with you — evolution and Mormon doctrine are not compatible excepting with a large amount of mental gymnastics.